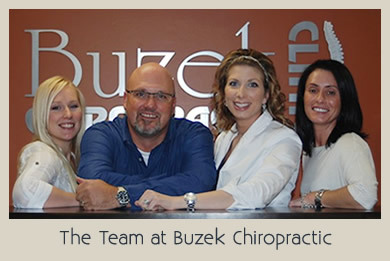 Since 1995, Buzek Chiropractic Clinic has served the Leamington community with family chiropractic care for all ages. From assisting newborns to seniors, we’ll help you get out of pain and keep your health on track in the future. “To educate our community that life and health come from within and that the maintenance of health is far superior to the treatment of disease. It’s vital to your continued health that you understand how chiropractic care works and what it does for your body. We spend all the time necessary to explain what you can expect and how you’ll feel as you continue with chiropractic care. We’ll discuss the benefits of long-term care and how we can help you prevent future problems from occurring, so you can enjoy a lifetime of vitality. Our goal is that you’ll regain your health and have the energy to live the most fulfilling, enjoyable life possible. The multidisciplinary approach at Buzek Chiropractic Clinic means you’ll have a variety of solutions that we can use to help you feel great again. So many of our patients had lost hope, thinking that there were no options left for them to live actively and feel well again. We stay excited about what we do by seeing the difference chiropractic can make for these individuals! One of our patients suffered from lower back pain for over 50 years. During these five decades, this individual went from doctor to doctor, trying to find help for her pain. After only three weeks of chiropractic care, our patient no longer needed her walker to get around and finally found the relief that had eluded her for most of her life. Another of our patients used to face migraines and headaches daily. Regular chiropractic care has allowed her to cease her reliance on medication to cope with the pain. It’s a privilege to see our patients experiencing the benefits of chiropractic care. Health is our most important asset. Protect your family’s future by scheduling an appointment today!